Hyderabad produces 4,000 metric tons of garbage every day. During Ganesh festival 3,000 more metric tonnes of garbage is added every day of the festival. This amounts to 7,000+ metric tonnes of garbage. Cleaning this needs 3,000 labourers working in three shifts, using 94,000 plastic bags and numerous sanitation trucks. This is really mindboggling, isn’t it? Added to this, the immersion of Ganesha idols in water bodies goes unabated. The destruction cannot even be described. The POP Ganeshas take a lot of time to dissolve in water, but even when they do, they leave a lot lead and heavy metal residue. You can read more about this in this blog. In a week or ten days, almost all water bodies are clogged leading to stagnation. Just imagine the money that needs to be spent on infrastructure, earth movers, and sanitation trucks to clean the mess! The questions we really need to ask ourselves are these – Do we need this? Can we reduce the garbage load on our city this year by bidding farewell to Ganesha at home? As responsible citizens, we need to stop contaminating the water bodies, destroying nature to become protectors of nature, natural resources (air and water) and the life around these lakes. To start with you can choose to buy an idol made of clay in your local markets – plain clay idols, idols that contain seeds Ganesha. Better still, you can buy an idol that will have a positive in the future too. And that’s exactly what the Plant a Ganesha idol will allow you to do. 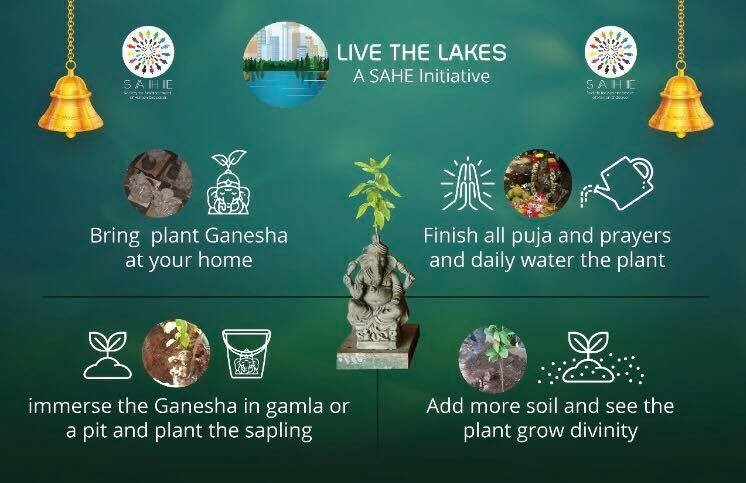 Brought to you by Live the Lakes initiative of SAHE, this clay Ganesha comes with a small sapling. Once you are done with your prayers, you can plant it in a gamla in your balcony or pit in your home, or in your vicinity and take care of the plant. Our city and our children will thank you. Say No to POP Ganesha idols this year!